Alan Lee to be at a Tolkien art exhibition in the U.K. in April: Is anyone going? ~ Detail from ‘Frodo’s Meeting With Gildor’ by Alan Lee. A JRR Tolkien and fantasy-inspired exhibition, featuring the works of Ted Nasmith and Ruth Lacon. Special invited guests are John Howe, Alan Lee, and Roger Garland. Included are brilliant original art and limited edition prints, music, costumes, memorabilia, quiz and prizes. Trade stands for Tolkien and Fantasy-inspired books, costumes, jewellery, weapons, birds of prey, games and more. 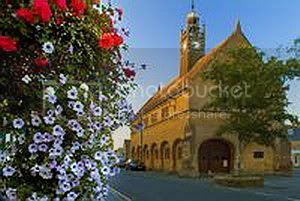 A spectacular exhibition, double the size of previous exhibitions, it will be held at the Redesdale Hall, High Street, Moreton in Marsh, Gloucestershire. Saturday 5th to Monday 7th April 9am to 5pm daily. (…) Not only will the exhibition be bigger, it will also have an incredible guest list and all the biggest names in the field of Tolkien art will be present. The exhibition will feature the works of Ted Nasmith and Ruth Lacon and there will be trading stands for Tolkien and Fantasy inspired books, costumes, jewellery, weapons, birds of prey, games and memorabilia. The event will include the brilliant exhibition of original art, for example the series of castles which Ted Nasmith made for a soon to be published book of author George R.R. Martin. The artists Ted Nasmith and Ruth Lacon will be present and the special guests are John Howe, Alan Lee, and Roger Garland! All under one roof, all at one event!! This exhibition is an opportunity to meet the artists and discuss the styles, mediums, and effects and enjoy the large selection of art. Maybe you can get even some of your precious books signed by them! There will also be large information and biographic displays on JRR Tolkien and the artists. Tolkien literature and antiquarian books, new books, memorabilia and games will also be on display. The exhibition will also have a program of Tolkien associated events bringing this experience to life, including, Music (live Tolkien song cycles), Readings and Quiz. The Tolkien society will also be attending providing information on membership. (Highly recommended for Tolkien fans). Entry is free. It should be a marvellous experience and I hope you can come along. 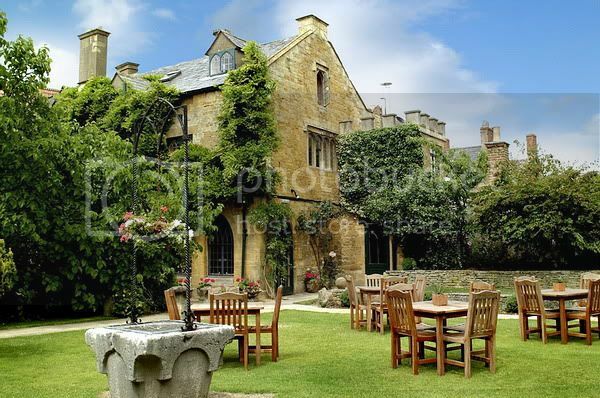 The Redesdale Hall is a wonderful and large old building in the centre of Moreton in Marsh, oak panelled, stained glass and very atmospheric. 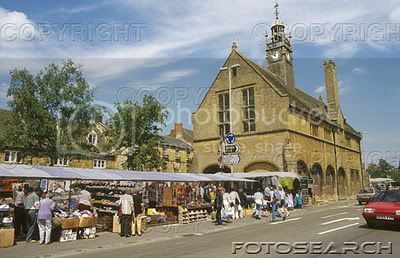 Situated in the Heart of the Shire with nearby landmarks that inspired or involved JRR Tolkien; The Rollright Stones (Barrow Downs), Broadway Tower, Dormston (Bag End), Buckland, Three Farthing Stone, Warwick (where Tolkien was married), Chipping Campden & of course Oxford. 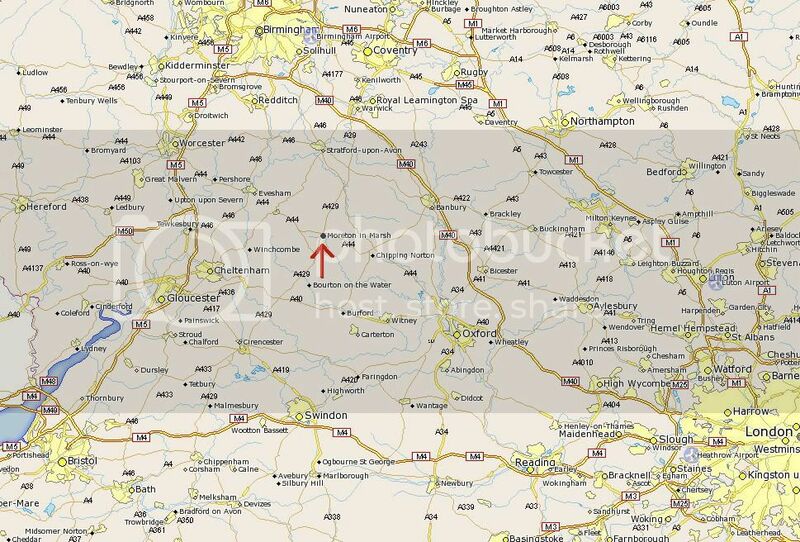 Moreton in Marsh has free and easy parking, it is 30 minutes north of Oxford, 50 minutes from Birmingham, and around 90 minutes from London, the Redesdale Hall is a very short walk from the station on the London Paddington main line. Doesn’t it sound terrific? I so hope some of my English readers are going. 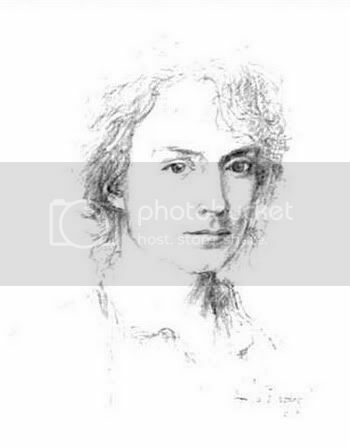 Which leads me to the purpose of my post: for years, I have been pining and sighing for a real print of one of Alan Lee's portrait sketches of Frodo (see below). It’s pure Alan Lee, but when one compares it to his pre-film illustrations and sketches of Frodo (e.g. see image at top of post), it’s plain that working on the film made a difference to Lee's portrayal of Mr. Baggins. It’s not an *exact* portrait of film-Frodo, but film-Frodo definitely is an influence. I can't get enough of this drawing, it is so evocative: both detailed and sketchy, explicit and veiled at the same time, rather like its enigmatic subject. I made screencaps of it, too, from the EE extras, but they are not adequate for various reasons. 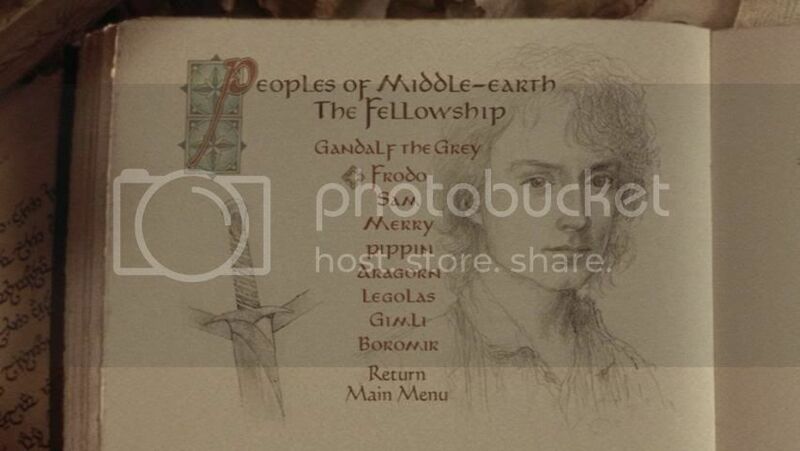 1The upper image (with no text on a white background) can be found on Disc 3 of FotR EE, in the Appendices Pt. 1, 'From Book to Vision'. 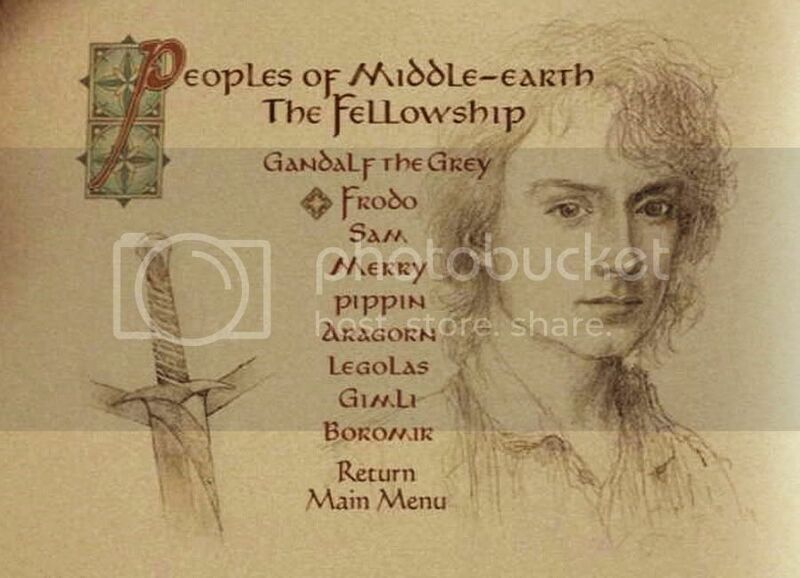 Just click open "Index" and navigate to "The Peoples of Middle-earth", page 5. Click open "Frodo"; this image is one of several. I have combed the Internet for a site that would sell a print of this drawing; I have asked around in Alan Lee-related sites for leads, but to no avail. I have found no address, email or snail, for reaching either Alan Lee or his agent (surely he has one). However, I know that some English fan-friends who went to an Alan Lee event several years ago asked him about purchasing copies of the drawing and he produced them, right there (signed!). If I recall, one person did not get one, because there weren't enough on hand, but she was sent it later. My request is this: if you are going, could you please ask Alan Lee if one might buy a copy of this drawing? I would send you a copy of the drawing to bring for reference. If prints of this drawing are not available at the event (I don't expect them be), I wonder if you could ask if a print could be purchased by mail. I would send you a letter to give him, and in it I would include all the details for my end of the transaction. Of all Tolkien illustrators, Alan Lee is my favourite. And this portrait of Frodo is my favourite of all Frodo portraits. I love the feel Lee has for Tolkien's world overall, and that "feel" informs this drawing. I deeply admire his aesthetic and his approach to making art. "To draw a tree, to pay such close attention to every aspect of a tree, is an act of reverence not only toward the tree, and toward the earth itself, but also our human connection to it. This is one of the magical things about drawing -- it gives us almost visionary moments of connectedness." Even if no one is able or wants to perform this favour, I still hope some of you get to go this. I would get a *huge* vicarious thrill to know you met my personal LotR-art hero. * A little bit of humour: On the IMDB thread for Lee, I saw that someone actually asked whether Alan and Christopher Lee were brothers. I absolutely adore that picture! Unfortunately, I probably won't go, even though I live in the UK now. Isn't it the loveliest piece? I so wish he had a website like other LotR artists (John Howe, etc.) do, offering prints for sale. It's a beautiful sketch and I'd say very heavily influenced by film Frodo:) I have seen it before though I'm not sure where. Thanks for considering it, Not Alone. I will make a reminder post periodically, just in case people don't see this one or just forget about it. It's in the DVD extras for the EE of FotR, the art gallery part, I believe. I made a screencap from it a couple of years ago, but it was no better at all--maybe not even as good. Wow, I can certainly understand why you would want a copy of that sketch for your very own. It is absolutely breath-taking. I will cross my fingers and toes that some kind soul can help facilitate your acquisition of this treasure. I wasn't aware of this event, because I'm no longer a member of the Tolkien Society and don't keep up much with Tolkien-related news, if at all. I think I would be quite tempted to go, were it not for the fact that I already have other plans in place for that particular weekend. Gloucestershire, Oxfordshire, Worcestershire ... they're all really beautiful counties. However, I'm not able to go to this exhibition. But if there was any way I thought I might be able to help with your request, I would. I love Alan Lee's work and very much like Nasmith's Silmarillion illustrations. I am not keen at all on Roger Garland's art though ... have you ever seen it? It reminds me of 60s psychodelic stuff: meh. I have never seen the work of Roger Garland. Sounds *definitely* not my cup of illustration art. But perhaps that will be a good thing for the sake of getting a wide draw for the show, such a variety of styles, that it. Alan Lee is nothing like John Howe, who is not like Lacon, who is not like Nasmith, etc. 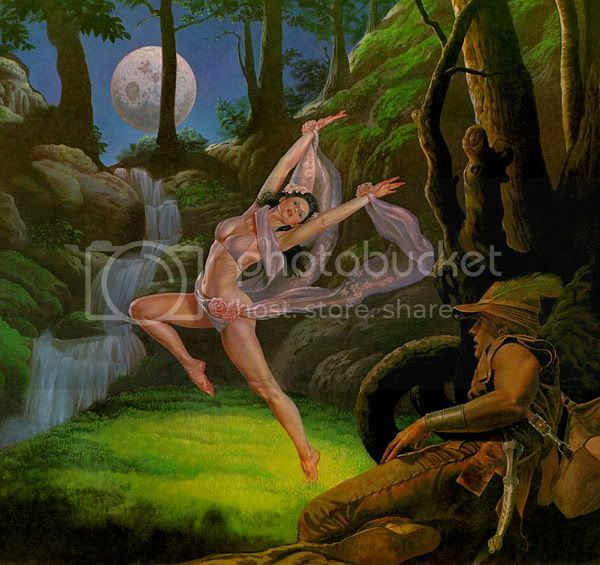 I haven't seen Nasmith's Sil work except for a beautifully-done scene of Turin finding naked and spent Nienor-Niniel. I should look up his other stuff. But, since you have a sense of humour, I'm going to post below what I think the most HILARIOUS Tolkien illustration I've ever seen, by Rowena Morrill. I found it on the Internet. Purportedly it comes from a 1981 Tolkien calendar. Isn't it the campiest thing? Look at that face (looks from her red cheeks like she's going to have to take a breather pretty soon). Look at that outfit! The Victoria's Secret lounge bra is great, but the roses that fix the diaphanous veil to her hip and wrists are the perfect tacky touch. Maybe she got Luthien mixed up with Salome? Beren seems to be dressed as one of Robin Hood's 'Merry Men'. And "Hubba hubba! Whoa, dude!" seem to be his thoughts, rather than expressions of wonder. Beren in this illustration is reduced to a garden variety Peeping Tom, just lying back and enjoying the show. Beren and Luthien? I would never have guessed! I am always interested in artistic interpretations of Tolkien's work ~ but after seeing this I appreciate Alan Lee all the more for his seemingly innate vision of all things Middle-earth. 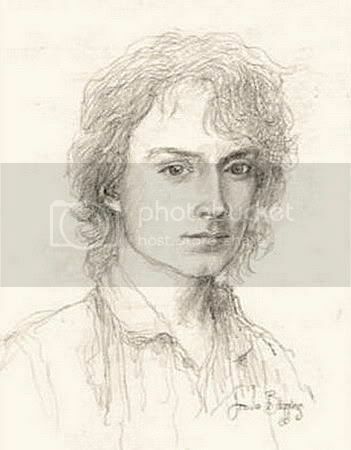 I agree that this a beautiful sketch of Frodo. Neither would anyone! Just imagine Tolkien's face if he had lived to see this, poor fellow. I'm not going (sadly!) but I do hope you get your wish! I was lucky enough to meet Alan Lee at an art show in Atlanta (I was given the auspicious job of holding the door for him at the show, I was afraid I was going to faint I was so excited) He is as gentle and gracious as you have heard. He later signed my Hobbit, and I gave him a little package with a gushing letter and about the huge influence he has had on my work. I expected him to put the package aside for later, but no he opened it right there and read it (with me getting all teary). He looked at my prints and talked with about them like I was, well an artist :) I'll never forget it. He loves talking technique and is completely open about his process, a real generous soul. That is a beautiful drawing, I hope someone here is going and will be able to ask for you. Cat, what a sweet-souled reply. I remember there being a picture on your website of you and Alan Lee, or am I mixing your site up with some other artist's? If it is you, then this account makes the picture that much more worth looking at. He really does sound like the loveliest person. Opening the package right there! That's so sweet. I really was charmed by the way he appeared in the FotR EE Extras, which was the first time I'd ever seen him or heard him speak. I love the way he spoke about his art and the way he worked, his voice soft and melodious, his words thoughtful, even contemplative. Dear Anonymous, Thanks for commenting! Lee's book is full of great little nuggets. I hear that the same is true of John Howe's new book, "Fantasy Art Workshop". I just bought it but haven't yet read it. It's nice to meet you, but what do you call yourself? You posted your comment without being logged in (and thus showed up as "Anonymous").